Things take a sharp left turn at the beginning of Battlestar Galactica's third season, as we jump ahead by over a year and return to the life of a pioneering human race on an inhospitable planet, New Caprica, now at the mercy of an occupying Cylon force. Beginning, as is its way, with a number of disparate plot threads - which will weave more or less harmoniously throughout this epic season premiere - it seems like the writers of BSG just suddenly decided to be Very Very Clear about what they want to talk about. Suddenly introducing timely themes of unwanted occupations, civilian insurgency, torture and suicide bombings, the human- and Cylon-occupied planet of New Caprica is at once a recollection of American colonies, early Israel, World War II, and Iraq. Forget all that Old Testament stuff, we are now being much more relevant - uncomfortably so! Mixing and matching from our recent history, the episode demonstrates the dangers inherent in an occupation - even a well-meaning one. The first thing we thought of. 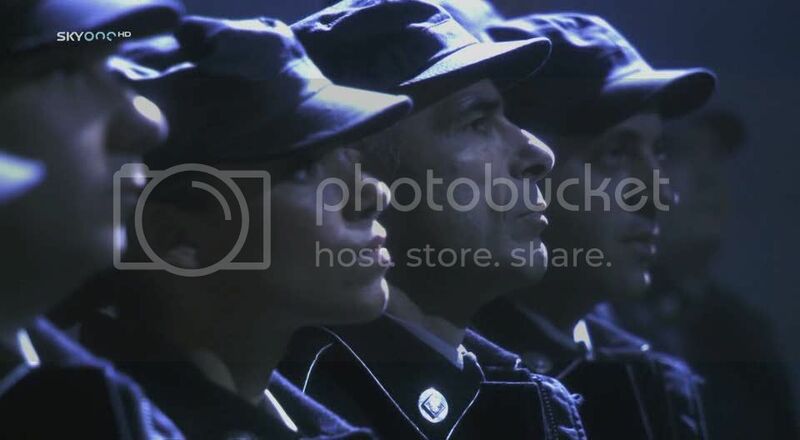 To signify the passage of time and significant life experiences, almost all of the characters exhibit visible signs of change: the former Colonel Saul Tigh (Michael Hogan) has lost an eye, Admiral Adama (Edward James Olmos) now has a mullet and moustache (deadly combination), Kara "Starbuck" Thrace (Katee Sackhoff) has longer hair and Lee "Apollo" Adama (Jamie Bamber) has put on about ten kilos. Furthermore, in their new roles as pioneers, insurgents, oppressed people, collaborators and would-be saviors, characterizations have suddenly expanded and developed. The decent Chief Tyrol (Aaron Douglas) is a Karl Marx-like agitator for socioeconomic justice and prominent member of the insurgency, Gaius Baltar (James Callis) has devolved into a debauched and reviled collaborator, wallowing in clammy self-loathing, and our favorite Cylons - Caprica Six (Tricia Helfer) and the original Sharon (Grace Park) - are pro-human advocates from within the Cylon administration. It is, overall, insidiously depressing and beautifully told. It's sad because everything and everyone has changed for the worst. Suddenly, in this post-apocalyptic landscape, everyone is a well-meaning murderer and everyone is suffering. Everyone's a victim. There's a lot to be said that even the Cylon occupiers, with an allegorical vibe hovering uncomfortably between Fascist Germany and the Coalition Provisional Authority (CPA), are shown to be just as terrified, incompetent and hate-filled as their human counterparts. It makes for highly provocative viewing, and seems to advance further along the difficult path of moral relativism. Is motivation or action more important? And which should be punished? How? By who? Suddenly the idea of an all-knowing, all-powerful God is comforting. It means we don't have to take the horrible responsibility of deciding what to do with those we deem "wrong" - we can let God handle it. But, since divine justice is difficult for we mortals to depend on (and, often, just plain believe in), both humans and Cylons take things into their own hands - with disastrous results. "Uh, we're supposed to bring the word of 'God' to the people, right?" "To save humanity from damnation by bringing the love of 'God' to these poor, benighted people?" BROTHER CAVILL(S): "Let's review why we're here, shall we? Uh, we're supposed to bring the word of 'God' to the people, right? To save humanity from damnation by bringing the love of 'God' to these poor, benighted people... But I want to clarify our objectives. If we're bringing the word of God, then it follows that we should employ any means necessary to do so, any means. Yes, fear is a key article of faith, as I understand it. So perhaps it's time to instill a little more fear into the people's hearts and minds." There's a very good book about the CPA in Iraq during 2003-2005-ish, Imperial Life in the Emerald City by Rajiv Chandrasekaran. It shows the destructiveness of well-meaning evangelism, especially when driven by a single-minded (here, almost exclusively Republican and pro-Bush) mentality steeped in ignorant ethnocentrism. The Cylon occupation doesn't outwardly exhibit the same monochromatic political spectrum as the Republican-heavy CPA did, but it does carry the same prosletyzing earnestness and frightening mismanagement. Out of the gulag? Or Abu Ghraib? Poor, destroyed and destructive Tigh. Which brings us to the insurgents: the triumvirate of the grizzled and tortured Tigh, the heroic resistence fighter Sam Anders (Michael Trucco), and the idealistic Chief, they are at once sympathetic and repugnant. We sympathize because of their suffering, but we are horrified by their "desperate measures in desperate times" (i.e. suicide bombing). It is, ultimately, tragic - almost harrowing. Particularly Tigh, who's tenuous grip and losing battle with inner demons, lends him a terrible frailty - when you couple that with murderous rage, it's just awful. He has, unexpectedly (but as many people predicted! ), become our favorite character, if only for the amount of sheer change he's undergone and the awesome complexities. 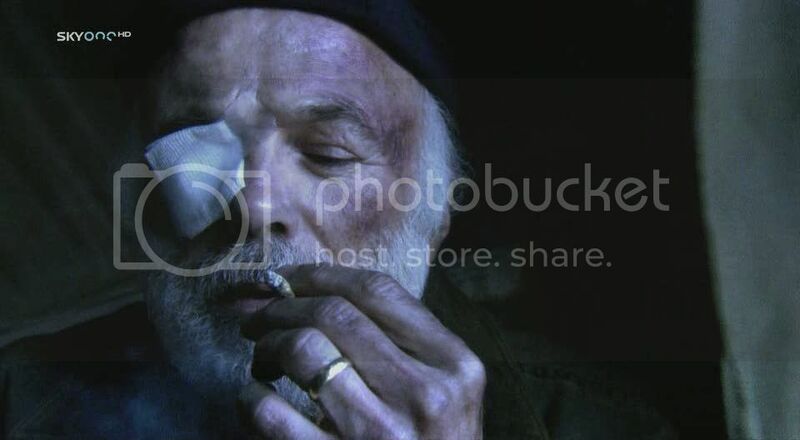 Poor Tigh! Terrible Tigh! Oh my, oh my. Matt - Just watched it, and had to hide my tears because I was in public! Oh my goodness me. Also, just watched the later episode when Kara and Tigh trash talk... well, the living, and then are scolded by Adama. 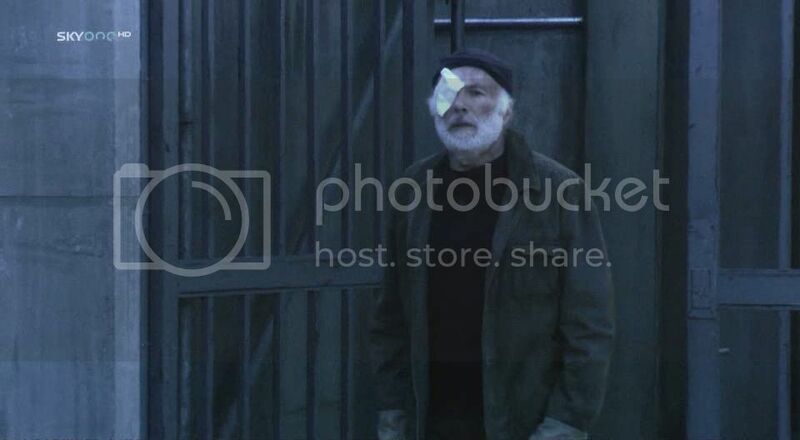 Kara's OK, but Tigh spirals into purified misery! Was so depressing. I also loved the sudden way we found our beloved crew on a desolate color washed-out planet instead of space. Did you see the 10 part webisode about life on the planet? Ties up alot of loose ends and makes you wonder why it wasn't included on the show itself. Tigh rocks but then again every character does with their multi layered characters. Being Doc Bollywood I have to mention how I also love the use of Eastern musical instruments in the soundtrack - especially the tabla. Keep the reviews coming because believe it or not - the show actually keeps getting more and more amazing.